Ryan Caicco, Nike Trainer, Performance Coach and Owner of Strive Life Athletics offers safety tips and exercises for those with arthritis, injury and joint pain. Listen to your body. Seek first to establish a mind body connection as the foundation for listening to your body. Do a body scan by asking yourself some questions on how you’re feeling, and pay attention to the type of feedback you receive from your body. This will help you set up a game plan. Master the fundamentals. Doing nothing at all and being in a sedentary state is never good. We are meant to move, regardless of our capabilities or limitations. Focus on mobility, flexibility and stability to create a solid baseline and foundation. Move with purpose and intention to find your full range. Never force the range or move beyond what you are comfortable with. Moving to discover tension that may cause some discomfort is okay, but moving while experiencing pain is a no. Keep movements, slow, smooth and steady. 1. Standing Hip Hinge. Standing in a neutral tall position, soften the knees, hinge the hips, and place your hands on your lower back to ensure it stays flat. Push the seat (bum) back slowly in order to find some tension. Keep your back flat and your rib cage locked down. Come back to standing and repeat. 2. Standing Spinal Roll. 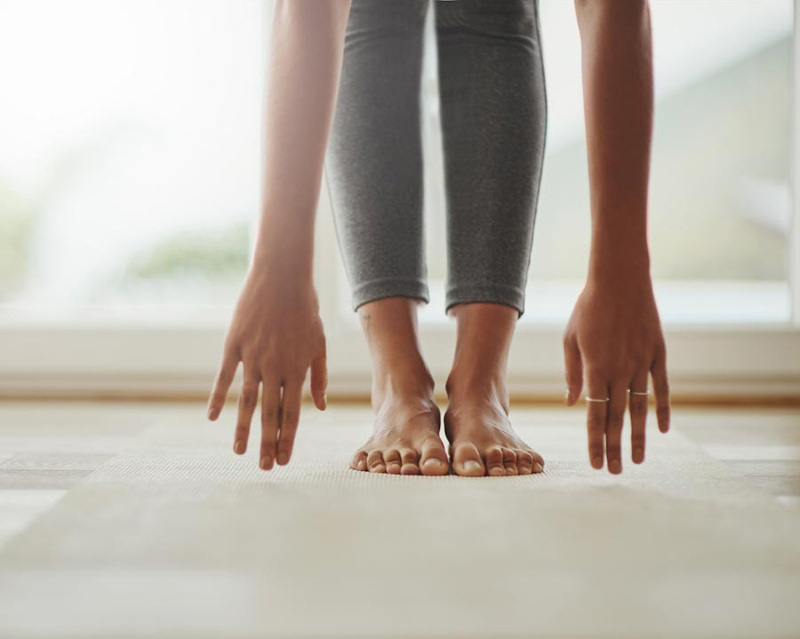 Standing in a neutral tall position, soften the knees, roll the shoulders in and begin to slowly round your back, arms are hanging down so that you can reach your toes, once you hit the bottom, slowly make your back up to standing. Repeat as needed. 3. Shoulder Circles. Standing in a neutral tall position, reach one arm up overhead and start with small circles in one direction and then the other direction, repeat on the other arm. 4. Kneeling Hip Opener. Starting on all fours with knees on the ground, step your right foot outside of your right hand to enter a hip opener, come back to all fours and then switch to do the same thing other side. 5. Kneeling Bird Dog. Starting on all fours in a table top position, engage your core, brace your lower back, squeeze your glutes as you extend one leg back, reach the opposite arm forward to draw a straight line cross body. Come back to your home base position and repeat same movement on the opposite side. Don’t stop. Continue to explore and evaluate how you’re feeling. This will allow you to progress your baseline and continue to build a stronger foundation of understanding. Over time you will know how much is too much, and how little is not enough, but whatever you do, don’t stop the process.